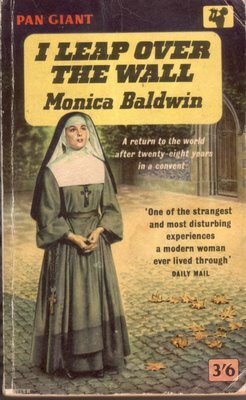 Monica Baldwin (1893 � 1975) lived as a nun for 28 years and, once she had left her enclosed order, wrote of her experiences. She was a niece of British Prime Minister Stanley Baldwin. Baldwin joined a religious order in 1914, a few months before the beginning of the Great War. After 28 years in an enclosed Catholic convent, she left on 26 October 1941, during the Second World War after rescript was granted by the Vatican. At the age of 27 she began to think she had made a mistake but it was another 18 years before she managed to leave, convinced that she "was no more fitted to be a nun than to be an acrobat." Among her jobs outside were a gardener in the Women's Land Army, a matron in a camp for conscripted girl munitions workers, an army canteen hostess peeling potatoes and once a photographer offered her a job developing "dirty pictures" in his cellar. After that she was an assistant librarian and then a War Office employee. In 1949, she published a memoir, I Leap Over The Wall: A Return to the World after Twenty-eight Years in a Convent. The book, later sub-titled, Contrasts and impressions after... is a memoir of some of the contrasts between life in an enclosed convent and life out in the contemporary world. Baldwin relates how she could not recall reading a newspaper during the entire course of the First World War. When she entered, the popular use of telephones, cinema and radio were in their infancy; when she left they were common in England. Her novel, The Called and the Chosen, written as the diary of Sister Ursula Auberon, an enclosed nun at the Abbaye de la Sainte Croix, Framleghen, was published in 1957 by Farrar, Straus & Cudahy. The book followed the 1956 publication of The Nun's Story, a novel by Kathryn Hulme. I have always felt that the moment when first you wake up in the morning is the most wonderful of the 24 hours. No matter how weary or dreary you may feel, you possess the certainty that...absolutely anything may happen. And the fact that it practically always doesn't, matters not one jot. The possibility is always there.